On the surface, it might not seem like adventure travel and global public health have much in common. But Physician Assistant student Bria Schurke '19 thrives in the places where they overlap. Her experiences in both areas have shaped her career path as she seeks to make a difference in her rural Minnesota home. Following in the footsteps of her father, noted Arctic explorer Paul Schurke of Ely, MN, Bria Schurke is passionate about outdoor travel and adventure. For years, she has served as a climbing and mountaineering instructor for the National Outdoor Leadership School, leading trips in Idaho, Alaska and Wyoming. She guides weeks-long courses that teach other would-be explorers wilderness first aid, topographical map navigation and even rope rescue skills. Participants range from total beginners to outdoor experts. "The goal is for them to leave the course having a foundational knowledge to go and do a trip on their own," Schurke said. While helping others get outside of their comfort zones, Schurke has also set a bold course for herself. A lifetime of adventure has included childhood trips to Siberia and a 2,900-kilometer canoe expedition across Mongolia and eastern Russia in 2013. Her excursions have included public health work in Rwanda and Somalia. In Rwanda she worked on maternal and child nutrition projects for a United Nations non-profit organization while finishing her master's in public health. During her time in Somalia, she taught public health courses and worked on the main floor of the Edna Adan Maternity Hospital. The experiences solidified Schurke's interest in becoming a PA, something she'd been considering since eighth grade. She enjoyed the wide breadth of her work, which allowed her to experience the full spectrum of healthcare. "I found out that I like the aspect of doing broader health work and preventative care," she said. Meanwhile, her experience as a guide has given her the ability to thrive while serving in unpredictable circumstances. "It's helped me build a tolerance for adversity and uncertainty," Schurke said. "Especially in global health, you don't know what's going to come next. There are cultural challenges, language barriers, and physical challenges, and you have to be open to uncomfortable situations." She enjoys solving problems in the moment, a skill set that's in demand whether she's teaching a prenatal nutrition class in Rwanda or conducting a rope rescue drill in the mountains of Alaska. "I like the uncertainty that comes with both worlds." She enrolled in St. Scholastica's first-ever Physician Assistant Studies cohort, which started in fall 2017. She was drawn to the program in part because of its emphasis on rural healthcare resources, an area that's important to her. "I am a fervent defender of our rural communities in Minnesota, and am very concerned about the sustainability of rural medicine in the long term," she said. "I found personally that as wonderful as global health is, I know my own community best. I'm from Ely." PA program chair Dr. Kim Kruger said Schurke is a passionate, bright student who brings a wealth of experience to her St. Scholastica education. "She has the unique skill to relate to patients on a personal level and still be able to think broadly about the effects of healthcare decision-making on the community and beyond," Kruger said. "Rural Minnesota needs providers just like Bria who care deeply for their patients and also for the greater community." Schurke says she has been impressed by the program so far, particularly the new Health Science Center facilities, the amount of hands-on experience she's getting, and the dedication of the faculty. "They definitely care about us, and our success is their motivation," Schurke said. "Dr. Kruger is one of the more phenomenal people I've ever met." As for what her future career holds, Schurke is drawn to Northern Minnesota, but staying open in terms of what area of medicine she wants to pursue. It's all part of her love of the unknown. "The beauty of being a PA is that I'll be able to try everything." St. Scholastica's Physician Assistant Studies program offers many hands-on learning experiences that give students the confidence to succeed on the job from day one. Students practice casting, splinting and suturing, and gain clinical experience through partner sites and the maurices Community Clinic, which is housed in the Health Science Center and serves uninsured and underinsured patients. 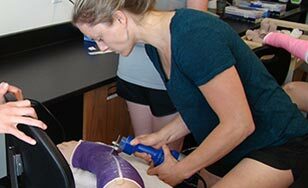 The intensive program also allows for interdisciplinary collaboration with other healthcare majors, including Exercise Physiology, Athletic Training, Social Work, Health Informatics and Information Management, Nursing, Occupational Therapy and Physical Therapy. Learn more about St. Scholastica's master's, doctoral and professional programs.